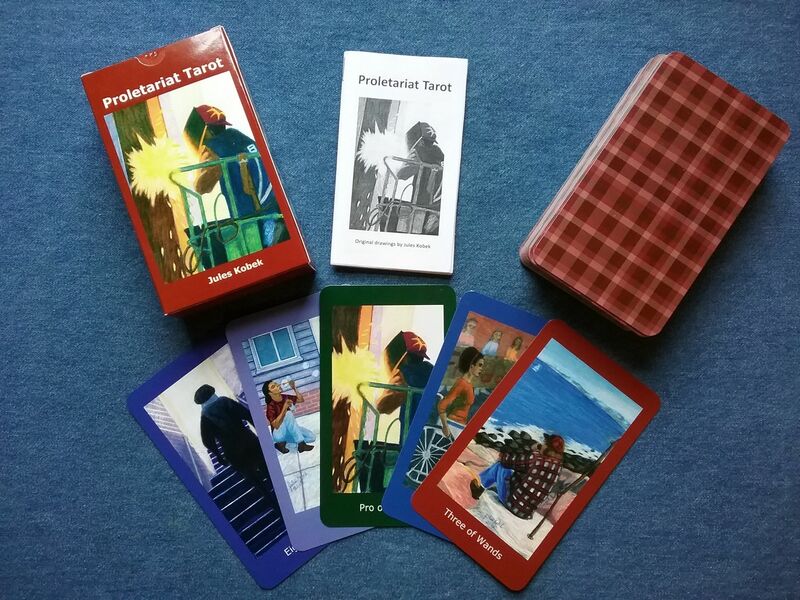 The Proletariat Tarot is a contemporary deck that honors the experiences of regular folk, the working people and the disenfranchised. Included are 22 Major Arcana, 56 Minor Arcana, and an instructional booklet in a tuck box. $39 plus shipping and handling . Click Here to Order a Deck! Here’s a picture of the box, instruction booklet, and the back of the deck! 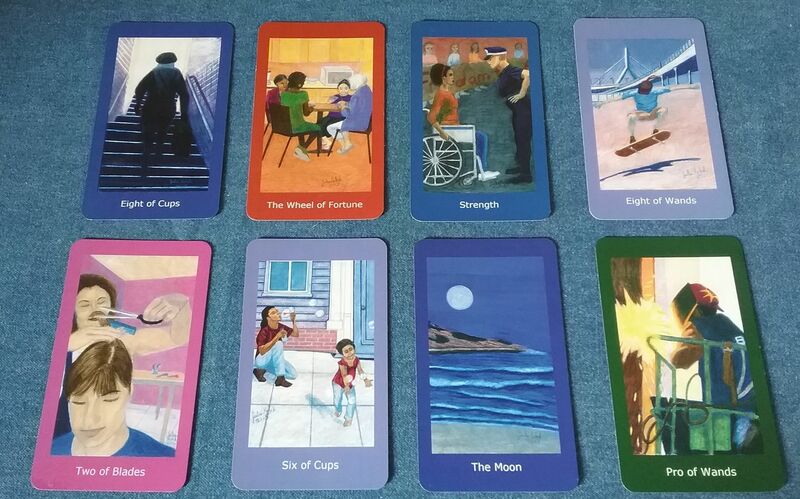 Designing a tarot deck has enabled me to combine some of my artistic interests (the human figure, daily life, allegory) with my desire for social justice. I’ve appreciated tarot since I bought my first deck as a teenager. The cards to which I have been drawn were not the kings and queens, but those depicting peasants, laborers, the poor, the homeless. In my interpretations of the cards, I want not only to update the scenes to contemporary times, but also to show the dignity, even the nobility, of the everyday lives of regular people and to suggest that the sacred may reside in the most mundane moments. The word proletariat refers to the working class, regular people, common people, in contrast to the kings and queens portrayed in more traditional tarot decks. In ancient Rome, proletariat was the name given to the lowest class of citizens. In Marxism, the proletariat are the wage-earners. Tarot cards originated in Italy in the 15th century as playing cards to entertain nobles and other upper class people. In later centuries they were used for fortune telling. Some people use the images as aides in their personal and spiritual development. The fifth suit is a trump suit called the major arcana. It depicts symbolic scenes such as justice, temperance, and the wheel of fortune. I hope you enjoy the Proletariat Tarot! Proletariat Tarot at the 1369 Coffee Shop! Hanging pictures for my exhibit! liz_ahl@yahoo.com on My first solo exhibit!